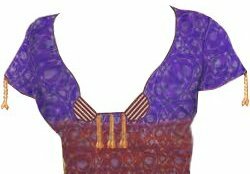 These two are designed as per the new fashion trends in India and some of other Asian country.This looks very modern ,beautiful and fashionable.This designs of blouses with neck designs can be worn with sleeves and also without sleeves.These designs are more comfortable with any kinds of Indian sarees . It's a upper garment and was formerly worn by Asian Women with different type and different designer saree.But now a days it has become more popular world wide.Here you can see exclusive collection of Indian celebrity saree and different and latest neck designs of blouses. We will be add more designer blouses and its neck style.So keep in touch.